If you have the dungeon, we have the dragons! 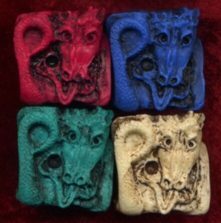 Our Dragon Dice and Nightmare DiceTM are intended to represent the hand-carved, bone, or ivory novelty dice of the past. They are produced in hand-poured molds, and each one is individually ground to clean up the mold lines and then stained to bring out the details.